Simply Seagrove tells the story of one family's discovery of a very special beach community and how Seagrove Beach became their second home. 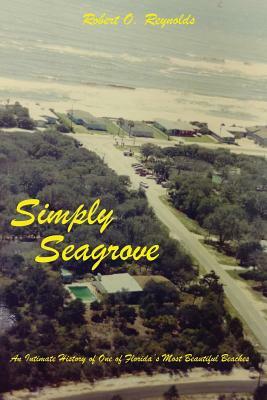 This informative but fun volume explores every facet of the Seagrove experience, reviewing the background of the area, the history that made it what it is today, and the things that make it unique. From the ancient ancestors, to the people who developed the community, to the generations of attractions, to the hurricanes, to the amazing natural environment, Simply Seagrove explores the people and events that have shaped Seagrove Beach. Robert O. Reynolds tells you how Seagrove got its name and how the area was developed starting in the 1920s, and later in the 1950s. He describes the many bodies of water that help make the area such a fun place to visit, from the Gulf to Choctawhatchee Bay, the coastal dune lakes to the bayous. Reynolds and his family and friends did lots of exploring over the years, and he takes you everywhere from navigating small canals in a Boston Whaler, to digging up Native American pottery in the dunes, to photographing a comet from the bluff. From the plants and animals like Spanish moss and Portuguese Men Of War, to the squeaking sand, to the origin of phrases like "Redneck Riviera," to filming a movie at Eden Gardens, he covers it all.